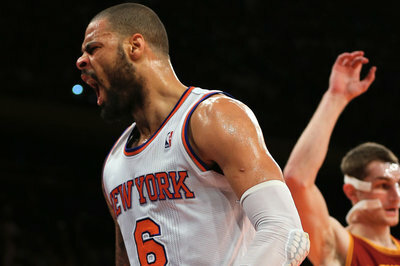 Tyson Chandler is expected to miss 4-6 weeks after an examination today discovered a fracture to his right fibula. The injury occurred last night in the first quarter against the Bobcats. Guard Kemba Walker landed awkwardly on Chandler’s right leg, causing the knee to buckle. Chandler had to be helped to the dressing room and needed crutches to leave the arena. The fracture is considered “minor” with no ligament damage, meaning the veteran center will not require surgery during the healing process. Over four games, Chandler averaged 7 points, 9 rebounds, 1 steal and 2.5 blocks. I hope the Knicks can expedite their plans to reacquire rights to Jeremy Tyler, because this team has a daunting month and a half ahead with Chandler sitting. Bargnani at center will not work. Stoudemire? NO. Time to dust off Kenyon Martin’s minute restriction, hope Cole Aldrich can withstand a trial by fire, and pray we can at least keep up in the top half of the standings through December.